Before us today there are many litanies of these righteous people. However I have selected from all of these for you the litany (hizb) of the great Imam, in whom there was gathered profuse knowledge along with utmost taqwa of Allah ((عز وجل. An Imam who dedicated all of his life in the path of Allah ((عز و جل in knowledge, action, abstention (zuhd), remembrance, service to the generality of the Muslims and giving sincere advice to their Imam’s. He is Imam Yahya bin Sharaf al-Nawawi who passed away in the year (676 Hijri). It is my conviction that if this Imam was not from the great godly righteous friends of Allah, then Allah the most High does not have on the earth any friends after him. Our discussion will become lengthy if I entered into the mentioning of his biography and unveiling of his unique states, excellences (manaqib) and qualities. However it is sufficient for you to know that the Imam, Ali bin Abdullah al-Kafi al-Subki, the father of Taj al-in al-Subki, author of ‘Tabaqat al-Shafiyyah’ -and he is well known for his immense virtues and vast knowledge-came from Cairo to Damascus intending the ‘Dar al-Hadith’ to visit Imam al-Nawawi, as he (Allah have mercy on him) was resident there. A spot touched by al-Nawawi’s foot. This great Imam had a litany consisting of supplication, invocation and prayer that he would recite daily along with his other litanies which was his habit. This litany of his was met with widespread acceptance from the scholars and Imams after him till this day. 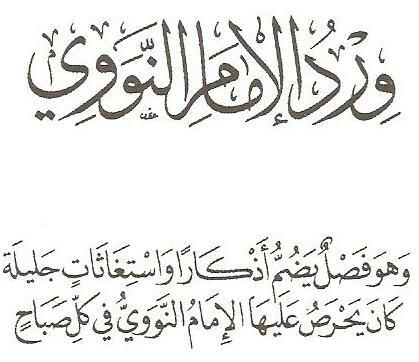 They recite it every morning, and its reflects in their heart the radiance of tawhid, the familiarity of intimate supplication (munajat) and pleasure in the slavehood of humility to Allah (جل جلاله). It is from the prayers (ibtihalat) proven for the relief of distress and repelling of the plots of the oppressors…I will not lengthen the commentary, for I have personally experienced the blessing of this litany. For its light has grown in my heart, and I have witnessed many of its effects in my life. So make a firm resolve to be regular in its recitation every morning with the attention of the mind and humility of the heart, and this is after your completing the invocations which I advised you with.